Too darn hot, that’s what this summer has been – at least for making socks! So, here are two dates in what just has to be the cooler month of October, in time to learn how to wrap up your feet for autumn & winter in the wonder of wool. The first of our two scintillating workshops is on SATURDAY 6TH OCTOBER. 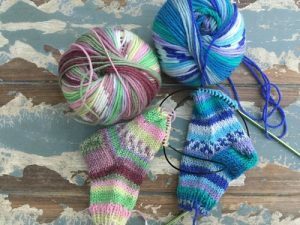 It will take place at Lower Drayton Farm, Penkridge, Staffordshire, Wool@J13’s showground and will run from 0930 – 1700, offering participants the chance to learn how to acquire the skills necessary to tackle the majority of sock knitting patterns. Toe-up or cuff-down, you’ll be an expert by the end of the day and will come away with a pair of Wee Rowdy Socks as a perfect example of both techniques and equipped with all that is necessary to make a pair for whomever you choose to make. The second of our workshops is on SUNDAY 14TH OCTOBER is also taking place at Lower Drayton Farm, Penkridge, Staffordshire and also running 0930-1700. 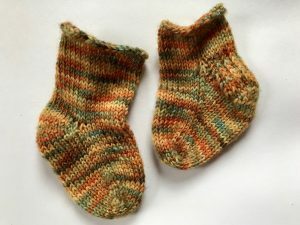 This workshop will offer participants the chance to learn how to knit two socks at the same time on a circular needle and, for that reason, our most esteemed tutor has called it the Two at a Time Sock Knitting Workshop. Production lines eat your hearts out! Heel flaps & gussets will never be a problem again and pair of baby socks will be yours to take home, treasure & refer back to for how the heck did I do that Qs & As. 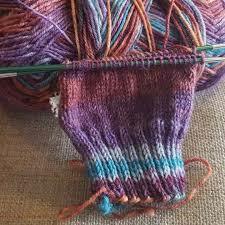 You will be learning to knit socks cuff down (that’s the bit you put your feet into when you put your socks on).